Like this one, there are only three in the entire world. Further envied for its beauty and value, from stolen items collectors and from treasure theives, the Epitaph of Gllavenica has been the last while an object of study of Albanian and foreign historians and scientists. 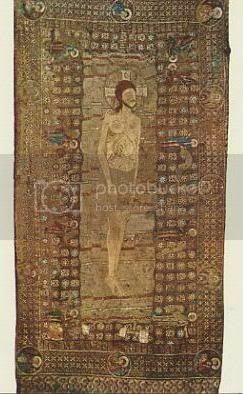 This rare object dated around 1373, in the center of which lies the body of a deceased Jesus Christ, lying on the shroud, surrounded by the Saints and angels, created a mystery for scientists, of which have been interested in uncovering more surrounding the creation of it, along with its realization. “The Epitaph of Gllavenica is among the most important objects which we inherited from the Middle Ages of Albania. It is created like a picture, while using all the elements of one.”, says Frederick Stamati, head of the laboratory of archeometry and conservatism nearby the Institue of National Culture, of which has directed the studies on the Epitaph. According to him, this work, stolen once in 1995, registered one year later and now in the Museum of National History(Albania), has a variety of colors, shadows, symmetricness and a tint of imaginary light , of which lights the entire Epitaph and gives an almost heavenly glow. “Unfortunately, our Middle Ages is poor in manuscripts. Studying the makeup of the material structure of an object is like discovering it from the inside and to take the data, from which you can draw out the conclusion. This is the reason why we undertook line of sciencie studies of the material that is used for the realization of the Epitaph.”, - explains Stamati, whom in the Congress of the Academic from around the world reported the Epitaph and the conclusion of the analysis. These studies are taken from the Laboratory of Archeometry and Conservatism and Restoration, near the Institute of Popular Culture, working together with the Laboratory Center of Museum Restoration of the National Hungarian Museum and the Royal Institute of Inherited Culture in Brussels. For the accomplishment of this study, two well known historian, the Hungarian Marta Jaro and Belgian Jan Wouters, specialists of color analysis of the fabric. According to Stamati, besides achieving the uncovering of the make up of the threads, of which was used in the make-up of the Epitaph, studies of the accomplishments give light on the origin of these threads and its merchant relitionship. For giving a name on the origins of these threads, in the make up of which are uncovered elements of silk, gold, silver and copper. Those studying the piece are refered to the studies of Hoke and Petraschek – Heim, whom rellying on the reprt of copper and silver, distinguish between the products created in Europe and the east. According to them, on the basis of this report, the thread used for the Epitaph of Gllavenica is created and traded from the East. This tells us about a trade connection that has existed in the XIV century. Frederick Stamati tells us that the same threads we find on other products that are saved in other European museus. Reagrding the colors, in it we note four main colors on the base: Red, blue, yellow and green. According to him, six centuries have already past and so the light test have noted that there has been color loss, so it is difficult to discuss anything with certainty and to value any of the shades of a while back. Nevertheless, except for the time changes, three shades have been noted for all colors. “The shades of each color are used mostly on the clothing displayed in the Epitaphs for the formation of light-shadows, displayed on Saint Luke, Saint Mark and Saint John the Theologian, or for the the distinguishing of different clothes or to shape the lines of the parts of the body. This is done for the hair, beards, lips, eyes, nose, fingers and most importantly for the light-shadows of Jesus.”, adds Stamati. According to the analysis that are made, the results show that the colors of these are from four flowers and two insects, of which did not just grow in Albania but were exported to the Vatican. Do you know what means "Gllavenica"? Im assuming its a slavic toponym so no. South Albania is filled with Bulgarian names. This is most likely an Albanian corruption. I think that glava means head in slavic. The -ica is a slavic suffix. Felix do you know anything else about Arianiti family and its origins,etymology of the name? The family was considered to be the most powerful Albanian family until Scanderbeg and even for a while after. They controlled lands from Vlore to as far Dibra(Moisi Golemi Arrianiti had that until he was captured and killed by the Turks). George Arrianiti was considered to be the first Albanian to inflict a defeat on the Turks when he ambushed an army sent by Evrenoz(Hodgkinson, Scanderbeg) and then managed to defeat two other armies between 1433-1436. According to John Fine, the Late Medieval Balkans, he states that the family appeared in power around the sametime most other Alb tribes started appearing, after the death of the Dusan Empire. "To the north of Janina two major tribes had emerged. The Arianiti (Araniti) and the Musachi"
Around 1421 both him and the Castriot family accepted Ottoman suzerainty. As for the ethnic origins. I could not say. As I stated, the family had come to existance probably during the time of the of the Despotate. They are listed as a tribe so it wouldnt be unlikely if the name had some Byzantine origins which thereafter the Albanian tribesmen used to identify themselves. For me is a pleassure to see, that we are thinking equally about that. I asked about that, because in Bulgaria there are few settlements with the name "Glavinica"(Glavinitsa), and one of them is near to the town where i was living before. Poly tha itheles to eponimo Arianitis na min exei albaniki katagogh, alla distixos gia sena einai poly albaniko epitheto. Egw i idia exw zhsei stin Ellada pola xronia kai exo dei sta arxeia gramena sta ellinika oti afto to epithieto einai apo albaniki oikogeneia. An zeis Athina mporeis na pas sta arxeia tis Herald... den to thumamai kala alla einai sti Patision kapou kai exei arxeia gia tis oikogenies kai ta epitheta. An kaneis kai ena kalo pasxsimo sto internet tha katalabeis oti einai apo aristokratiki oikogenia tis Albanias kai oi Arianites exoun desmo kai me ton Gjergj Kastriot Skenderbeu. Feja e shqiptarit eshte shqiptarizmi ! If someone has a comment directed toward a member, there are always Private messages to suit that, which I would recommend. I dont know Greek therefore I cannot say with certainty that that comment is directed toward Patrinos. But I am assuming so. What I sad is that: You are wrong about the Surname Arianiti. It is not probably Byzantine origin but it is very Albanian last name, and the Albanians never used something to identify themselves. From the centuries Albanians were identified as a very old population. If you knew a little bit more about history probably you shut know right now what Albanians are and from where they come from. But the Greeks and the Serbians are the same: they can take what is not theirs. Jamander calm down. First I didn't say that Arianitis was a Greek family. I said about their surname which as Kastriotis' surname have meaning in Greek.And I'm curious why did they have greek surnames. I don't think that it has albanian etymology as you said. I know very well what are you and who you are then and now. Don't forget that we have alot of Albanians here in Greece and I have and albanian friends so I've understood your mentality. Can you say more detailed what Greeks claim that are not "ours",please? PS I'm glad that you know greek, where did you learn it,ido you live in Greece?? Jamarber, what sort of half breed (apparently with albanian consiousness) are you? What do you mean "half-breed"??? who is this "pure-breed" here??? What are these racist terms??? Arber can you answer to my questions(of my previous post) which jamarber don't answer? There's no need to get personal. Please behave yourself. Half breed not with degratory meaning. He speaks apparently fluent greek but is albanian. The question was (is) serious. How are they Greek surnames? What do they supposedly mean? And for your information, there's a clan in northern Albania with the name Kastrati. The greek version of castle is Kastro. And following the rules of greek grammar the man who is from Kastro is Kastriotis. (see Diodoros Siceliotis,he was from Sicelia). Every Greek when hears that name understand its meaning.Greece has plenty of villages,towns,areas called Kastro or Kastri. Arianitis means the one who is from Aria.Aria as a placename is present in Greece and etymologiacaly come from Aris(the god of war) following the structure of Greek language became Aria as a toponym(see Alexandria). A great percentage of Greek surnames has this types of suffixes(-otis,-itis,-atis).For sure it isn't an albanian suffix.What do that names mean in albanian? Re Patrine giati kourazese bre agori mou?? Aristera tha breis stis glwsses kai Ellinika. Akous kapote den upirxan synora opote katalabeneis ti ginete. Ti paei na pei Elliniko onoma, prepei na ksereis oti Kastri exei Latiniki riza episis kai h boria Albania tote htan katholiki opws kai akolouthei na einai se kapies polys. Akoma kai simera yparxei to tribe Kastrati stin Albania sthn poly Dibra. Auto einai kati pou den mboreis na to amfisvitiseis giati einai grameno apo Istorikous. Kai gia na milame kai sobara milame gia kati pou einai meta ta Tirana boria den exei kamia sxesei me tin Ellada. Kai na sou pw kai kati? Egw as poume exw megalwsei stin Ellada kai poles fores mou einai pio efkola na milaw ellinika kai spiti mou akoma ellinika milame alla den eimaste ellines, eimaste Albanoi poly Albanoi mes stin kardia mas kai sto emma mas. Euxarisoume tin Ellada gia tin morfosh pou mas edwse alla den tha riksoume pote tin xora mas pou mas xarise Zwh, thn xora ton Progonon mas, kai tin Agapimeni xora tou Aetou!! !